I often encounter work-related initiatives to improve a client’s product development and delivery. One is the agile or lean approach. I was invited to speak to the Agile Leadership Network of DC by my friend Manjit Singh, who is also the co-author of The Lean Playbook. While I am not an expert in all things agile, I spoke to the group about the importance of understanding the context in which they work, that is, the organizational culture. 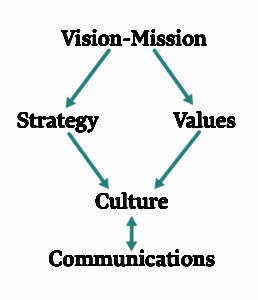 It takes a disciplined and creative mind-set to adopt and promote agile or lean processes, but key to success is working within an organization that values inclusive and purposeful communications that is able to manage change and ambiguity, and consistently demonstrate commitment to quality and integrity as core characteristics. It means more than adapting new practices, and includes building one’s emotional intelligence, and moving from models of how to do work to how we value work. Business agility is “distinct qualities that allow organizations to respond rapidly to changes in the internal and external environment without losing momentum or vision. Adaptability, flexibility, and balance are three qualities essential to long-term business agility.” Of course, part of this is the capacity to use data and technology to quickly and flexibly respond to new market information, hence AGILITY. The LEAN organization uses fewer resources, teams (preferably small), and timelines to get results. This tracks with our work in organizational change and change management, which is about enabling people to adapt new behaviors related to their work, in dealing with others both internally and externally, and to implementing more efficient and effective work and communications protocols. It all begins with clearly defining the company’s vision and strategy, and this is where leadership is vital. This simple illustration shows the relationships among the various components of an organization’s culture. A company’s culture reflects the vision/mission, strategy, values, cultural norms, and behaviors of the company; while the employees bring along the sum total of their idiosyncratic, professional, and life values that define them. Integrating all of these within the context of an agile initiative is challenging and complex. It is my contention that agility is critical for the collection and feedback that enables this model to be sustainable and innovative. If the work is not sustainable, then why adopt it? This is where the role of leadership begins and continues. It is not uncommon that a company’s culture is perceived as the main obstacle to introducing and managing change, in this case the utilization of agility principles. This is culture beyond ethic, national, gender, and other stereotypes. It is how people feel about the work and their expectations. Ira Kaufman, the guru behind entwine digital, first introduced me to the notion of the transformational mindset, which begins with purposeful leadership, that quality of recognizing that digital transformation begins at the top and incorporates values, behaviors, and a strong sense of community, both internally and externally. The central role of values is evident throughout his work, and emphasizes collaboration, empathy, good will, shared purpose, clarity, consistency, and commitment to change, values that MUST be modeled by the organization’s leadership. It is apparent that without leadership at all levels committed to the transformation of business practices, agility will not drive the changes in processes, production, consumer relations, and quality control that enable the agile eco-system to thrive. This is as true for business and industrial entities as for agencies, NGOs, and any group that serves a client/customer/membership base. Those who have not yet adopted this approach to managing change often lack access to the data that drives teams looking for solutions. Thoughtful leadership knows, as Peter Drucker is alleged to have said, that “Culture eats strategy for breakfast.” Leaders who ignore building a dynamic culture will fall back on acronyms, electronic messaging, and the overuse of consultants as substitutes for appreciating how a diverse organization nurtures and sustains deliberate and inclusive change strategies. I used the word sustainable before, a term not common in the agile literature. Yet, it is essential. To succeed, beyond being perceived as another development tool, the agile mind-set, internalized in the company’s DNA, encourages traits that are desirable in any setting: collaboration, focus on results, short-term delivery, and customer focus. The agile approach is sustainable. 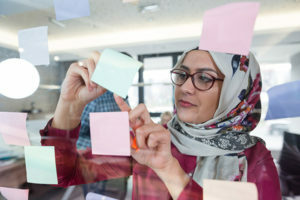 The key understanding is the connection between being agile as a tool and attitude, how it translates into an organization’s communications protocols, and how it is expressed as a function of the organization’s culture. Leadership is essential to enabling and awarding agile teams so that the culture supports a sustained practice of being agile. It starts at the top.